It is impossible to disprove a negative, which also means that it is impossible to prove that something is safe. The best you can do is perform the best possible studies using the best possible protocols. Then you compile and publish the results and hope that sanity will prevail. You'd think that the Journal of the American Medical Association (JAMA), one of the premier medical journals in the world, would come down on the side of sanity. "Obsessive-compulsive disorder, particularly when it has an early onset, is associated with a pervasive and profound decrease in educational attainment, spanning from compulsory school to postgraduate education." Despite the lack of any training in psychology, formal or otherwise, I like my diagnosis here. How else can you explain JAMA's obsessive attempt to find anything wrong with BPA, despite the fact that the FDA just published a comprehensive 249 page, two-year study (in draft form) which concluded that there was nothing to fear from the chemical. If a diagnosis of BPA-OCD is insufficient to fully convey the magnitude of this obsession then I'll have to dig deeper into the DSM V and find something worse. The reason for all this foreplay is an article by Jennifer Abbasi which appeared in the latest JAMA. It is crazy-making. There are a few Neptune-orbiters who simply cannot stand the fact that they've been (very) wrong about the (non) threat of BPA all along, evidence notwithstanding. And it is Ms. Abassi who has been tasked with convincing us that the evidence deniers should be believed. Jennifer Abassi's LinkedIn page. 99.44% Science-free. Hmm. It would seem not. Which makes me wonder if I'm perhaps I'm underestimating my own credentials. Back to JAMA. The American Council has had some problems with Ms. Abassi's writings in the past. (See my colleague Julianna Lemieux's 2016 takedown JAMA: Journal Of Alternative Medicine Atrocities.) Abassi seems to be fond of "alternative medicine." And her new piece, "Scientists Call FDA Statement on Bisphenol A Safety Premature" only confirms our sense of bewilderment about why an English major is writing nonsense for what is supposed to be a prestigious journal. Let's take a look at some low points in the article. After laboratory cell studies first identified BPA as a chemical that mimics and disrupts hormone systems, government and industry studies of BPA-exposed laboratory animals have generally failed to reveal adverse effects, while a slew of studies from academic laboratories have shown effects at low doses." J. Abassi, JAMA. Published online March 21, 2018. doi:10.1001/jama.2018.3288. When in doubt, go conspiracy. The study is a bunch of garbage. There is a big government conspiracy to falsify data on a gazillion safety studies because it is paid off by industry. "The core study also found an increase in mammary gland tumors at the lowest exposure dose, a result that researchers said was downplayed in the FDA statement." This is the voice of Laura N. Vandenberg (University of Massachusetts), a spokesperson for the Endocrine Society. Vandenberg who fails to realize that certain results in the study are artifacts. This is one of them. The so-called "increase" was observed only in one of the ten groups of female rats, and only in those that got the lowest dose of BPA. Also, the breed of rat used (Sprague-Dawley) is known for the spontaneous generation of tumors, even in the absence of test chemicals. These data make it is perfectly clear that this so-called increase in tumors is an artifact, not a real effect. I'm betting that Vandenberg must know this but just doesn't want to admit it. If there were anything to this claim then mammary gland cancers would have been found in the other 9 out of 10 groups, and at a variety of doses. The fact these other cases do not occur makes the claims look silly. "[P]rospective studies have begun to link early-life BPA exposure to later outcomes like increased body weight..."
This is seriously lame as well. Why? Just look at the data. It is a mess. *mpk is milligrams of drug per kilogram body weight of the rat. 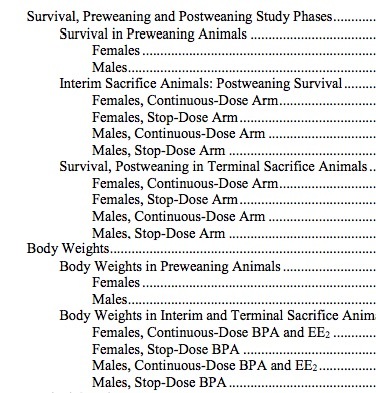 There is no rational relationship between the dose of BPA and the weight of the rats. The lowest dose (2.5 does "something" while all the other doses, higher and zero, do "less." This looks like numbers pulled out a hat rather than real data. It's not easy, but the data look even worse when you examine it in graph form. 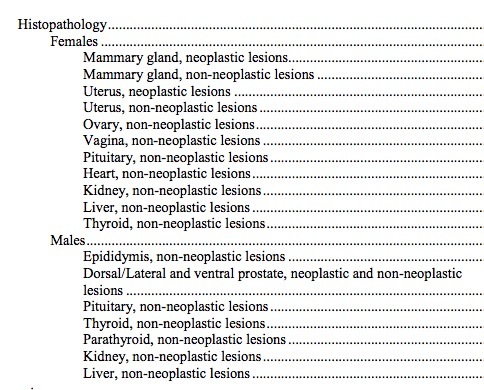 "The endpoints here do not encompass the full effects of endocrine-disrupting chemicals.."
Aha. The old "we need more studies" song and dance. One would think that the FDA was doing nothing more than sitting around doing nothing (except taking bribes from chemical companies) for the whole two years. So, how do you explain this? That's a whole lot of nothing. Much like Abassis's paper. This stuff was getting tiresome 10 years ago. BPA-OCD scientist, please pick another scare. We are officially bored to death. Speaking of which, there is even a diagnosis for that. (1) Yes, I know we now use ICD-10-CM codes instead. I was too obsessed with ICD-9 to get around to finding the new number.